Posted on September 21, 2011 by elizabeth | Comments Off on 2011 Camper Reunion Dance! Do you miss all of your Fanari friends from this summer? Well, you’re in luck because the 2011 Reunion Dance is here! 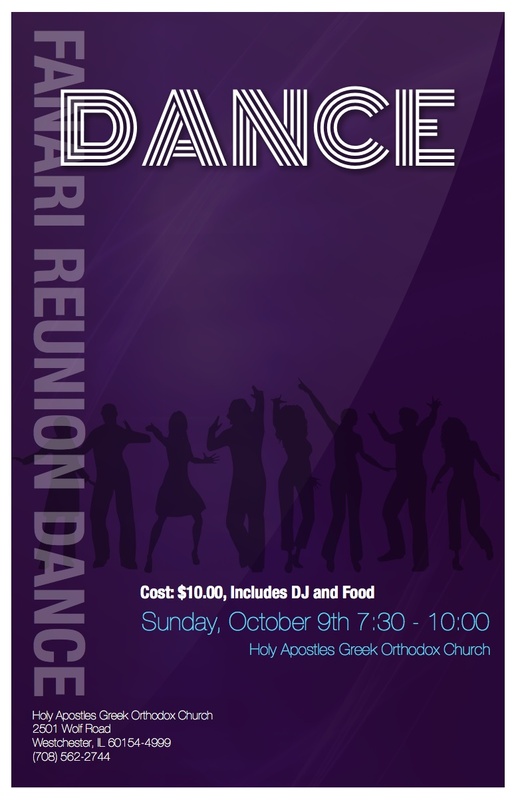 Mark your calendars for Sunday, October 9th for some dancing and food at Holy Apostles (Westchester, IL) with your 2011 Fanari Camp friends! Who? : All 2011 campers, counselors & staff! Comments Off on 2011 Camper Reunion Dance! We hope you’ll check out all of the pictures and videos from last week on our Fanari Camp Facebook page and YouTube channel! All of the links are on the side of this blog page. Don’t forget to “like” the Fanari Camp page, and look for more videos to come soon. As you can see from the pictures, we had a great week! Well, our 40th year of Fanari Camp is done! The campers are all on the buses and just pulled out of camp. Thank you to our counselors, staff and priests for all of your hard work and energy this week. Fanari couldn’t happen without you! Campers, we hope you had a wonderful week, made new friends and learned about our faith. We pray that the experiences you had at Fanari will be with you throughout your lives. We’ll see everyone on June 17 for Fanari 2012!!! Today was our last full day of Fanari 2011…and we saved the best weather for last. The sun came out a little and campers were able to enjoy their entire day outside! We had our regular activities and prepared for our last evening activity, Skit Night. Today we had some visitors at camp! 3 members of the Metropolis’s Pick Up Your Cross and Follow Me program came to participate in Fanari for the day. We were so blessed to have them as part of our Fanari community and loved having them here! Our Theater Staff did a great job coordinating the evening and all of the campers had fun with their songs and skits! The 11th graders closed their Fanari experience with the song “My Wish” and lots of hugs. Big congratulations to the campers and counselors of the 8th grade for being the Spirit Winners; they truly embraced the Fanari Spirit all week long! One last evening chapel, a slideshow of the week, and a few songs closed out our day. Time for some nani and then it’s time to head home. Today we have some guest bloggers, two 11th grade girls from Holy Apostles: Kristina Clark & Lia Kass. 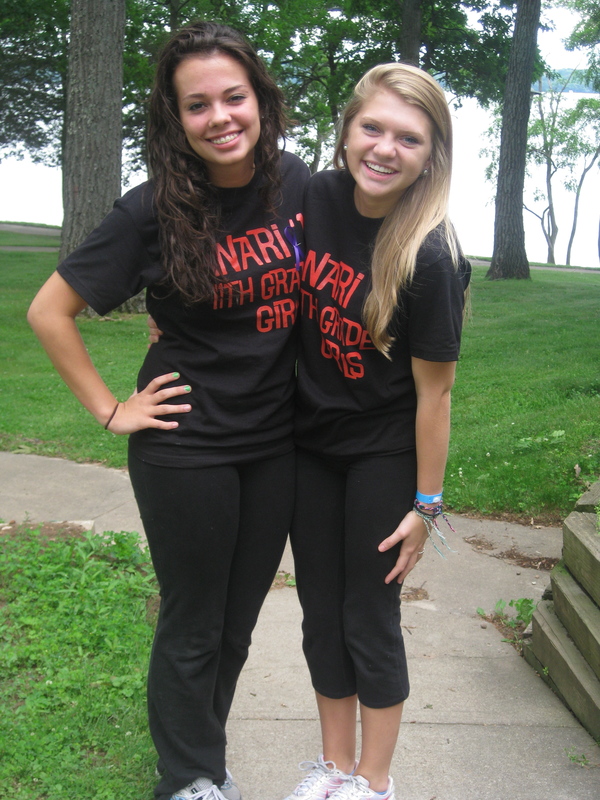 Thank you Kristina and Lia for sharing your Fanari experience with us! Coming to Fanari for the past 6 years changed our lives in a way we didn’t think possible. It is a place that taught us more about ourselves and our faith. Leaving behind the memories we have made is one of the hardest things we have ever had to do, and Fanari will always hold a special place in our hearts. Friendships made here at camp are impossible to find anywhere else, and it is a blessing to have had the opportunity to have something like Fanari. This camp not only brought us closer together with God, but has helped us to become stronger Orthodox Christians for the rest of our lives. While maturing in our faith, Fanari has been something we looked forward to every single year. We will miss you Fanari! Posted on June 24, 2011 by elizabeth | Comments Off on Fanari Loves the 80s! The morning started out with all of us celebrating the Divine Liturgy and enjoying a late breakfast. Unfortunately a light rain hung around most of the day, but the campers watched movies, played in the gym, and had some sing-a-longs. Our traditional cookout was served inside, and our water games were postponed until tomorrow. After lunch, Metropolitan Iakovos spoke to the campers and presented them each with an olive wood cross. Tonight we had our 80s themed dance and had an indoor “campfire” with stories from Mr. D. The campers dressed in their 80s finest, and enjoyed an evening of 80s, Greek and current music. The campers listening to Mr. D enjoyed some s’mores and some of his famous stories. We finished the night in chapel and are thankful for another wonderful day at Fanari- it’s hard to believe tomorrow is our last full day! Comments Off on Fanari Loves the 80s! Hey, you guys are good! Posted on June 23, 2011 by elizabeth | Comments Off on Hey, you guys are good! All of your prayers for good weather for us up here really helped! A few showers here, but it didn’t stop us! Wednesday was a great day as the campers went through their usual activities. Most of the campers received the sacrament of confession in preparation of celebrating the Divine Liturgy today. Last night featured “Let’s Make A Deal” with all of the campers and staff participating in a variety of games for the chance to win great prizes such as 1st in line for meals, free golf cart rides, and lots of candy! This morning we celebrated the Divine Liturgy and enjoyed a late breakfast. The campers are now enjoying a day of free time and we’ll be having hot dogs and watermelon for lunch. The rain is holding out for now, and we’re hopeful for a little sun tomorrow. Comments Off on Hey, you guys are good!